Infrared astronomy began in the 1830s, a few decades after the discovery of infrared light by William Herschel in 1800. Early progress was limited, and it was not until the early 20th century that conclusive detections of astronomical objects other than the Sun and Moon were detected in infrared light. 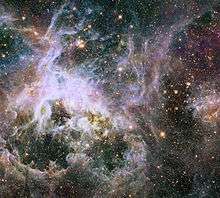 After a number of discoveries were made in the 1950s and 1960s in radio astronomy, astronomers realized the information available outside of the visible wavelength range, and modern infrared astronomy was established. The discovery of infrared radiation is attributed to William Herschel, who performed an experiment where he placed a thermometer in sunlight of different colors after it passed through a prism. He noticed that the temperature increase induced by sunlight was highest outside the visible spectrum, just beyond the red color. That the temperature increase was highest at infrared wavelengths was due to the spectral index of the prism rather than properties of the Sun, but the fact that there was any temperature increase at all prompted Herschel to deduce that there was invisible radiation from the Sun. He dubbed this radiation "calorific rays", and went on to show that it could be reflected, transmitted, and absorbed just like visible light. Efforts were made starting in the 1830s and continuing through the 19th century to detect infrared radiation from other astronomical sources. Radiation from the Moon was first detected in 1873 by William Parsons, 3rd Earl of Rosse. 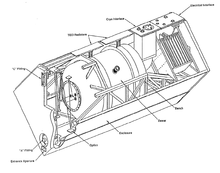 Ernest Fox Nichols used a modified Crookes radiometer in an attempt to detect infrared radiation from Arcturus and Vega, but Nichols deemed the results inconclusive. Even so, the ratio of flux he reported for the two stars is consistent with the modern value, so George Rieke gives Nichols credit for the first detection of a star other than our own in the infrared. Infrared radiation with wavelengths just longer than visible light, known as near-infrared, behaves in a very similar way to visible light, and can be detected using similar solid state devices. For this reason, the near infrared region of the spectrum is commonly incorporated as part of the "optical" spectrum, along with the near ultraviolet. Many optical telescopes, such as those at Keck Observatory, operate effectively in the near infrared as well as at visible wavelengths. The far-infrared extends to submillimeter wavelengths, which are observed by telescopes such as the James Clerk Maxwell Telescope at Mauna Kea Observatory. 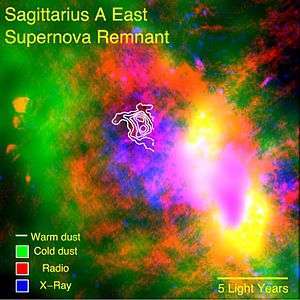 Like all other forms of electromagnetic radiation, infrared is utilized by astronomers to study the universe. Indeed, infrared measurements taken by the 2MASS and WISE astronomical surveys have been particularly effective at unveiling previously undiscovered star clusters. Examples of such embedded star clusters are FSR 1424, FSR 1432, Camargo 394, Camargo 399, Majaess 30, and Majaess 99. Infrared telescopes, which includes most major optical telescopes as well as a few dedicated infrared telescopes, need to be chilled with liquid nitrogen and shielded from warm objects. The reason for this is that objects with temperatures of a few hundred Kelvin emit most of their thermal energy at infrared wavelengths. If infrared detectors were not kept cooled, the radiation from the detector itself would contribute noise that would dwarf the radiation from any celestial source. This is particularly important in the mid-infrared and far-infrared regions of the spectrum. ALMA Observatory’s antennas appear to take in the sight of the Milky Way. 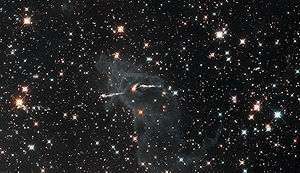 ↑ "Herschel Discovers Infrared Light". Cool Cosmos. Retrieved 9 April 2010. ↑ "First Results from the ESO Ultra HD Expedition". ESO Announcement. Retrieved 10 May 2014. 1 2 Rieke, George H. (2009). "History of infrared telescopes and astronomy". Experimental Astronomy. 25 (1–3): 125–141. Bibcode:2009ExA....25..125R. doi:10.1007/s10686-009-9148-7. ↑ Glass, Ian S. (1999). Handbook of Infrared Astronomy. Cambridge, England: Cambridge University Press. ISBN 0-521-63311-7. ↑ "Unravelling the web of a cosmic creeply-crawly". ESA/Hubble Press Release. Retrieved 18 January 2014. ↑ "Artist's impression of the galaxy W2246-0526". Retrieved 18 January 2016. ↑ "A Cosmic Rainbow in Ultra HD". Retrieved 17 August 2015. ↑ "IR Atmospheric Windwows". Cool Cosmos. Retrieved 9 April 2009. 1 2 3 Werner, Debra (5 October 2010). "Last-minute Reprieve Extends WISE Mission". Space News. Retrieved 14 January 2014.